A deep & punchy fat snare drum thud is a sound used in countless songs. Luckily, you don’t need a huge 15×8 snare drum to achieve this sound. There are a few quick and easy methods to get a great fat snare drum sound. These will work with just about any drumhead, and on most snares (okay, maybe not if you have a tiny piccolo snare drum). Best of all, these techniques are super quick and easy, and many are great for dampening your other drums as well. Further down the page, you’ll also see some tips on fine-tuning your fat snare drum… With a bit of practice and experimentation, you can become a snare sound master. Read on, and listen to some samples below. The recent popularity of this snare tuning trick comes from Udo Masshoff. While he is definitely not the first person to detune a few lugs to change a snare drum’s sound, he can be credited with teaching this method to a LOT of people. Check out his video here for more info. DISCLAIMER: This type of tuning is a little controversial… If you’re doing this with a cheaper snare drum, there’s a chance you’ll damage it due to the drumhead pulling unevenly across the drum. If you have thicker die-cast hoops, you don’t have much to worry about. Regardless, don’t leave your drum tuned like this for a long time – once you’ve finished playing, even out the tension across the head. Also, avoid extreme variations in tension, especially if you’re worried about damage. If you want to play it safe, skip down to Fat Snare Tuning Method 2 and 3, and avoid this one! Start with a higher tension tuning at the lugs between 10 and 2 o’clock. Tune the 3 and 9 o’clock lugs down to a medium tension. Tune the 5 and 7 o’clock lugs down to a low tension (around 1/2 a turn from loose). Tune the lug(s) around 6 o’clock down all the way, finger-tight. Add dampening if needed (Moongel, tape, your wallet). Take a listen to how it sounds both with and without some added dampening on the snare. Check your sound – you should hopefully have a nice deep and fat snare drum thud, while still keeping some tone. You’ll probably need to do some fine-tuning the first time you do this. Each snare drum is different, and small lug tension adjustments can have a big impact with this tuning… If something sounds strange, find the offending lug and give it a small turn with the drum key. Note: If your snare doesn’t have lugs in the exact positions mentioned above, use the closest lugs you have (see the image above as a guide). The important thing here is to have your lugs going from higher to very low tension, from one side of the drumhead to the other. Tip: Try different tensions for the 3 o’clock and 9 o’clock lugs. Tune down a little further to see what happens. Try the same for the 5 and 7 o’clock lugs. Tuning all lugs evenly low is the more traditional method for a fat snare drum. This is a legitimate and long-used tuning method to achieve a deep fat snare sound… The main difference with the all-lugs-low method is you might need to add more dampening to get a usable sound. If you’re less experienced with tuning, it can also take a little longer to get this one right. Tune all lugs to a very low even tension (usually between 1/4 and 3/4 of a drum key turn). That’s all ! While there are less steps with this method, you’ll need to be sure that all lugs are the same tension. Check your sound – with this fat snare tuning, you will probably need to make some adjustments to get a good tone. Like the other method, different snares sound best at different tensions, so spend a little time finding out what works for you… With a little practice, you’ll learn the best tension for your snare drum, and you’ll get quicker at hitting the sweet spot. Note: The most important thing with this method is to get all lugs the same even tension. Tap the drumhead near each lug, and check that the pitch matches all the other lugs. The more variance here, the more clashing overtones you’ll have. Tip: You’ll probably benefit from adding some dampening with this tuning method. Having all lugs at the same low tension allows for greater sustain and overtones, compared to the other method above. Here are some fat snare tuning tips, and these apply to both of the above fat snare tuning methods. Small adjustments can make a big difference to your sound. If something sounds off, try some slight tuning adjustments to individual lugs. Tap the drumhead near each lug to find the one that sounds strange, and give it a little turn. For the all-lugs-low fat snare tuning method, remember to have even tuning across the whole head (especially if you use little or no dampening). Check your snare drum’s resonant head tension. To get better snare wire response with a low and fat snare tuning, it’s best to have a higher tension resonant head. If you don’t need super sensitive snare wires and want to experiment, you can also try loosening the resonant head a little. Go too far here and your drum will sound dead, but you’ll probably find a great sound if you spend a little time on it. Tip: Check out our huge article on resonant snare drum heads to learn about how they affect your sound, and to see all the different snare side options out there. Experiment with your snare wire tension. To keep things sensitive, short, and snappy, tighten your snare wires. To add a nice long decay to each snare hit, loosen them… There’s usually one or two sweet spots where your snare wires will give a great sound. Depending on how loose your snare wires are, you may get a lot of snare buzz… If this is the case, loosen the 4 lugs closest to where your wires sit on the resonant side. You can also try changing the tuning of your toms – if a tom batter or resonant head matches a snare drum head’s tuning, you’ll be in for a lot of buzz. Change your tuning a little to avoid this. Add dampening to control things. Try adding some dampening on your snare drum if there are strange overtones that you can’t remove with tuning adjustments. Take a look at the different snare drum sound dampening tools available, or scroll further down to see even more easy fat snare sound methods. There are some great options to use, both with or without needing to re-tune your snare drum. The more extreme dampening tools can add even more fatness to your sound. Drumheads – they’re super important. Besides tuning and dampening, drumhead choice is the one thing that has the biggest impact on your drum sound. You can get a completely different sound simply by changing to a different drumhead, so it’s extremely important to understand what you’re buying. That’s where Drumhead Authority comes in… Compare drumheads with our drumhead selector, the web’s best tool to find your perfect drumheads. And it’s free. If you’re looking for a FAT sounding snare drum head, you’ll want to choose something on the thick side with some added dampening. 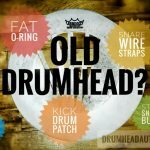 Take a look at these fat sounding drumheads as a great starting point, and then narrow down your choices using the filters on that page. For both of the above fat snare drum tuning methods, your snare drum will probably go out of tune sooner than usual (especially if you rim shot). After spending a few hours playing, you should get an idea of how quickly this happens with your drum. If you’ve only loosened some lugs, these will probably detune fastest, so have your drum key nearby to make adjustments when needed. Also keep check on the higher tension lugs (between 10 and 2 o’clock) – a quick tighten here can bring back a nice sound if it becomes dull. If you like to rim shot, check the lugs near where the stick makes contact with the hoop. If you’re playing a show, keep one ear on your snare drum sound to monitor whether it changes across time… Don’t be that drummer with a dead snare drum by the end of the show! (yes this happens). Get comfortable with making quick tuning adjustments, and you’ll become a snare drum sound master. This is also a great habit to get into with the rest of your kit. If you’re planning on using a fat snare drum sound, it’s a good idea to experiment with both tuning methods. 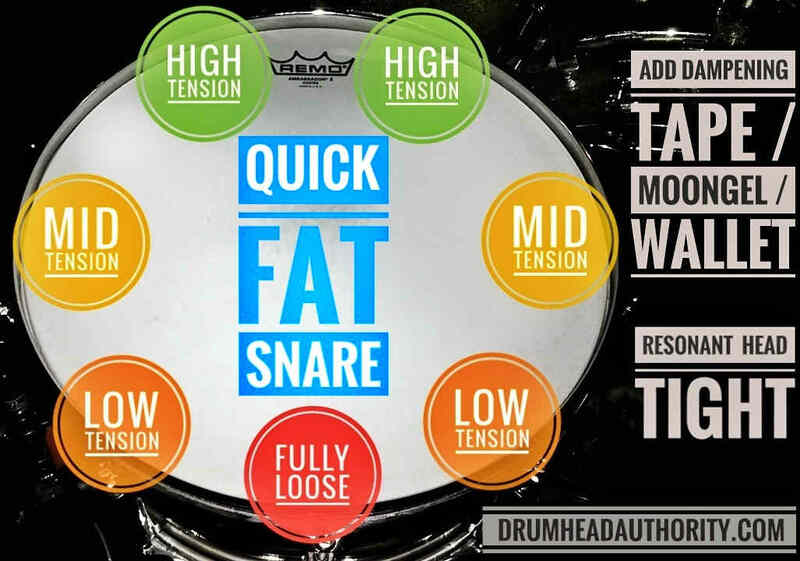 One fat snare method is not necessarily better than the other, so spend some time finding out which is best for your snare and drumhead combination. As mentioned above, there is a risk of damaging weaker snare drums with the half-lugs-low fat snare tuning method. However, there are also a few benefits for tuning this way, compared to the all-lugs-low fat snare method. First, ringing overtones are reduced due to the extremely loose tuning on part of the drumhead. This may seem a little counter-intuitive until you try it… The slack at one side of the drumhead reduces the head’s vibration, cutting overtones before they occur. Second, due to the above reason, you can get away with having minimal or even zero dampening (even with a very open sounding drumhead). If you do have strange ringing overtones, tap the drumhead near each lug to find the culprit and give it a small adjustment. The benefit here is that you spend less time matching each lug perfectly with the others, and more on the overall sound… This is extremely useful at a show if you need to quickly change tuning for a song. Third, you’ll have a more responsive area at the top of the drumhead. This is great for when you’re doing more sensitive snare work, when you need some extra stick rebound, or if you want to add a different sounding accent. Fourth, your snare drum will sound less out of tune, thanks to the higher-tuned lugs between 10 and 2 o’clock. Again this seems counter-intuitive, since there is such a huge variance in tension around the snare drum head. The important thing here is that the higher-tuned lugs add some extra life to the sound. Listen below to compare the half-lugs-low fat snare method vs. the all-lugs-low method. Your snare and drumhead combination may change things slightly, but this will give you a good idea of the differences between these two fat snare tuning methods. These snare samples are all recorded with an SM57 placed 3 inches above the snare rim, pointed at the center (no EQ; no compression; no editing). The snare drum is a Pearl Sensitone Phosphor Bronze 6.5″ x 14″, with a Remo Ambassador X batter head and an Ambassador Hazy snare side. Use good headphones when listening! Besides tuning your snare drum differently, there are a few other ways to quickly get a fat snare drum sound. Best of all, some of these dampening techniques are completely free. There are also some great products out there for getting a quick, easy, and very consistent fat snare drum. To make your life super easy, none of these fat snare drum methods require you to actually tune your drum… Quick, easy, FAT. Many of these drum dampening techniques are also great for your toms or bass drum, and each one gives a slightly different dampening effect. And, of course, you can also combine them with one of the fat snare tuning methods above. Method 1: You can lay an old (or new!) drumhead upside-down on top of your snare. This will completely cut the higher frequencies and give a deep, short, fat thud. Method 2: Make a thick o-ring by cutting up an old drumhead… a thicker o-ring = a fatter snare drum. Like an upside-down drumhead, these will reduce higher frequencies and instantly beef up the sound. Tip: For more info on both of these methods, see our top 9 tips on what to do with old drumheads. For a consistently great fat snare drum tone, get yourself a Big Fat Snare Drum. These are flat rings with a thicker rubber edge, and they sit on top of your drumhead to instantly fatten up the sound. There are a few Big Fat Snare Drum options available for different sounds, and also the Big Fat Snare Drum Snare-Bourine, which has tambourine jingles. These things are designed to be very easily removed, and sound great both live and in the studio. Throwing your wallet on the snare is a super quick fat snare drum method (remember, more money inside = more fatness). The problem here is that sometimes it will bounce around… Either getting in the way of your sticks, or falling off completely. The Drum Wallet fixes this problem; it’s designed to stay put. Importantly, it also stays consistently thick (unlike your real wallet), to give a consistently fat snare tone. The Drum Wallet attaches to the tuning rods with velcro straps, and can be quickly flipped on or off when you need it. Like the Big Fat Snare Drum, this is a great little secret weapon to have in your drumming arsenal. The Snareweight is a versatile tool for controlling overtones and fattening up your snare sound. It clips to your drum hoop and rest on your snare drum head, cutting high frequency ringing for a deeper tone. Importantly, the Snareweight isn’t stuck to the drumhead… This means it can bounce slightly after each hit to let some tone through, before quickly cutting overtones and adding some fatness. There are a few options available: The Snareweight M80 is a thick piece of leather that can be magnetically adjusted to add different levels of dampening. The Snareweight #4 and Snareweight Jr are thick pieces of metal that rest on your drumhead. Putting a sheet of paper on your snare drum will give you a quick fat snare sound. The paper creates a deeper snare tone, and deadens the sound, leaving you with a quick punch. Overtones and sustain are completely removed; the paper will completely remove the ringing from your drum. This sounds a little different to the other methods above, mainly because of the brighter “slap” sound that the paper gives when first struck. You can put a towel or piece of fabric on your drumhead to cut the sustain and lower the tone. Experiment with this dampening technique to find the sound that works best for you, because there are a few ways to do it. Heavier fabrics will give a more dramatic dampening effect, and the placement also matters. Covering your entire drumhead with a towel, for example, will dampen the drum a lot, and deepen the tone. You can tape a towel to a small part of your drumhead for less extreme dampening. Ringo Starr is the most well-known user of this drum dampening technique: He’d put towels on his drumheads when recording to get the short and punchy drum thud that has inspired countless others. This drum dampening technique takes slightly longer than the others, because it requires you to remove your batter drumhead. Take the head off, and stretch a thin piece of fabric across the drum shell where the head would go. You can use a small strip of fabric for a less extreme sound change, or a big piece that covers the entire drum for extra dampening. Pull it fairly tight (so there is no slack), then put your drumhead back on. The fabric gives a dead drum sound, and a deeper tone. With a large piece of fabric, the effect is obviously more extreme – you’ll have a quick and punchy drum thud with no sustain or overtones ringing out. As well as for you snare, this drum dampening technique also works for toms and bass drum, if you’re looking for a quick and punchy sound. Check out some of the other drum dampening and sound control accessories available, to get some extra fatness in your life. If you’re using dampening to get a fat snare drum sound, you can try lowering the tension of just one or two lugs as well… A quick few turns of the drum key will change your snare sound dramatically, so experiment a little. If your snare drum is normally medium or higher tension, detune one or two lugs by 1/2 to 1 turn of the drum key. With the added dampening, you’ll be able to get a nice fat snare drum sound. Remember exactly how much you turned the drum key, so you can instantly put your snare tuning back up to where it was. Some drums respond better than others to different tuning ranges and drum dampening techniques. If you’ve tried hard but really can’t get a good sound, try a different method or try things at a lower or higher overall pitch. There’s usually a sweet spot where drums really sing, and this range is different for every drum. This also applies to snare wires, the resonant head, and your other drums. Finally, with all of the above fat snare tuning and dampening methods, make sure you’re using them to complement your tuning. Don’t use them as a shortcut to hide a lack of tuning knowledge. Check out our pages on drum tuning basics and extra drum tuning tips to master the important stuff… Doing this will set you up for an even better drum sound, and will put you on the path to tuning success. Don’t be afraid to experiment, and don’t be afraid to remove the drumhead and start from scratch if you’re not happy with your sound. Tune your drums as well as possible first, then add dampening (if you choose) to get the exact sound you want. Once you’ve got the basic stuff down, you can spend time experimenting with the drum dampening techniques on this page to get the perfect drum sound for your style. 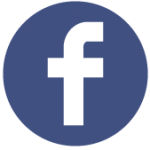 Want More Free Drum Articles? You got it! See the huge range of Aquarian, Evans, and Remo drumheads listed all on one page in the ultimate drumhead comparison chart. You’ll see over 130 batter and snare side drumheads, listed from the most open and thinnest, to the thickest and most controlled heads available. Best of all: it’s searchable, so you can instantly find and compare your favourite heads. Read our huge overview on everything you need to know about bass drum port holes. Why you do (or don’t) need one, what size port hole to make, where to place it, and how all of this affects your bass drum sound. New to the studio environment? 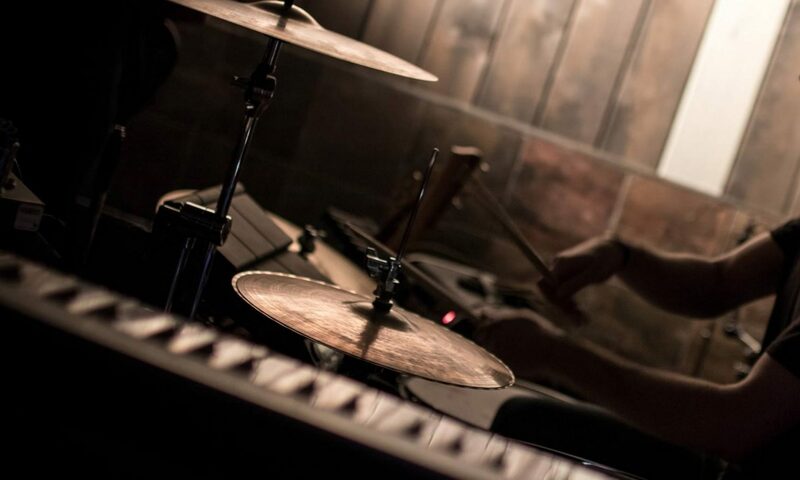 Here’s our list of the best tips on how to prepare as a drummer heading to the studio. Don’t get caught out, and don’t learn the hard way. We’ve got the most important things to do before you arrive, and when you’re there, to maximize your studio time and walk away with a top drum performance. Check out the Drum Sound FAQ for info on all of the important stuff that affects your drum sound. If you’re not sure what anything means here or in the drumhead selector, the FAQ is the place to look. See more drum articles, guides and tips here.